Babcia's is already proud of its pierogi, touting 23 flavors already at two spots in the Broadway Market, where the local business serves year-round. With Easter approaching, Babcia's Pierogi owners Linda and George Lund are close to opening a third presence at 999 Broadway: a deli-style grab-and-go counter with authentic Polish fare, available cold by the pound, ranging from czarnina (duck blood soup) to housemade sauerkraut, potato pancakes, kapusta (a cabbage soup with kluski), lazy pierogi, golumbki (stuffed cabbage rolls) and more. 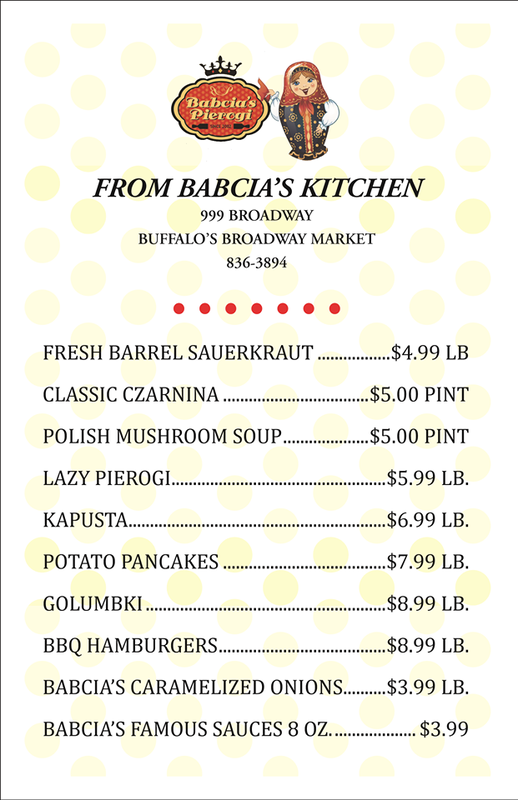 The grand opening for Babcia's Kitchen is March 30, roughly three weeks before Easter and Dyngus Day. The Lunds' original space is in the front of the market, where the husband-and-wife duo sells hot food for lunch. The second spot is a kiosk, which offers primarily pierogi, at the bottom of the market's escalator, open only on weekends. The new kitchen, situated two spaces from the butter lambs, gives the business more versatility and meets a need during a busy season. "We had the idea last year at Lent," explained Linda Lund, who has employs eight year-round and as many as 25 for the busy seasons. "Customers were asking for Polish foods to take home. It will be a natural thing [to have available] at Easter." While it won't dwarf the power of pierogi, Babcia's sauerkraut, available at the deli for $4.99 per pound, is created from cabbage grown by local farmer Tom Keeley - informally dubbed "The Slaw Man." Lund noted that she and her husband will make more than 8,000 pounds each year using a recipe, which involves oven-roasting, passed on by Keeley's family. For those following health trends, sauerkraut is high in probiotics, live bacteria that are believed to aid the digestive system and other bodily functions. Babcia's recently announced three additional pierogi flavors to its fleet, with jalapeno popper, potato and farmer's cheese, and potato, mushroom and blue cheese now available. The pierogi will be available at all three spots in the market. Linda Lund is excited about the progress of the Broadway Market, thanks to recent grant money, as well as its future, with $4 million of state money on the way. New food businesses - such as the Sweet Whisk bakery, Cali Eats (Mexican tacos) and Kathrene's: A Taste of the Philippines - have been added to the list of year-round vendors, preferred to seasonal booths that remain vacant for much of the year. From a production standpoint, the partnership between Westminster Economic Development Initiative (WEDI), the City of Buffalo and the host site to open the Kitchen @ the Market is another reason for optimism, as aspiring food workers - who specialize in a specific product - can capitalize on affordable space and new equipment to get their business off the ground.